After an impressive 2018 season, Grace College’s men’s soccer team was honored with five All-American nods. 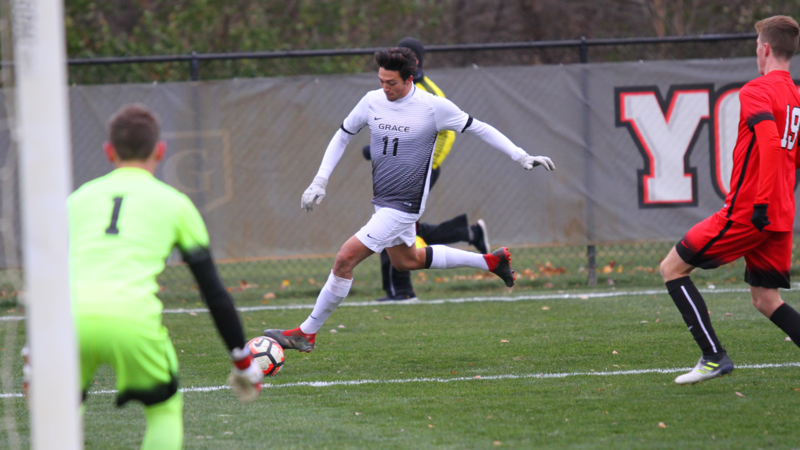 Kurt Hamlin and Cody Boerema highlighted Grace’s award haul by being named First Team All-American by the NCCAA and the United Soccer Coaches. Hamlin recorded 11 shutouts while playing every minute of the season as Grace’s goalkeeper. He was also named to the NCCAA All-Tournament Team after a strong showing at the national tournament. Boerema led Grace with 11 goals and had a team-best four game-winning goals. Josiah Osborn, Breno Oliveira and Ulisses Miranda all earned NCCAA Second Team All-American honors for Grace. Osborn started all 23 games for Grace in defense, helping protect Hamlin with 11 shutouts. Oliveira produced three goals and seven assists, all while trading time at multiple positions for Grace in the midfield and defense. Miranda racked up six goals and seven assists for Grace as a high-motor forward. Grace garnered multiple academic awards as well. Hamlin was named to the prestigious CoSIDA First Team Academic All-America, an honor which encompasses both athletic and academic accomplishment. The Lancers also had eight players earn Scholar-Athlete status from the NAIA or NCCAA: Togo Narusawa, Santiago Maya, Joshua Coupar, Henrique Cerruti, Oliveira, Zeb Johansson, Gabriel Osti, Osborn, Miranda and Hamlin.